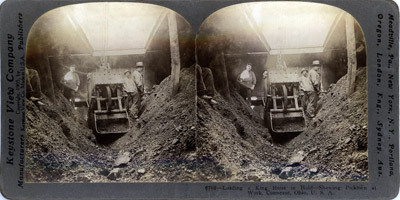 Stereoview of a team of four pickmen working in the hold of an unknown Great Lakes freighter loosening ore and shifting it into a hoist. 6702 -- Loading a King Hoist in Hold -- Showing Pickmen at Work, Conneaut, Ohio, U.S.A.
Meadville, Pa., New York, N.Y., Portland, Oregon, London, Eng., Sydney, Aus. The openings in the deck of the vessel are called hatch-ways. They are 24 feet apart in most vessels. In the largest modern vessels they are but twelve feet apart. The clam-shell bucket descends into the hold of the vessel with jaws wide open. As the power is applied to lift it the jaws are drawn downward and thus a bite is obtained. In this view the bucket has just closed upon its load. In one minute it will have emptied its ore in the car or the ore piles, and be back for another bite. The pickmen must keep the ore drawn under the hatchway so that the bucket can get a full bite. The machines take out what they can get easily from one hatchway and then move to another. The men will then shovel the ore into position for the work of the clam-shell bucket when it again returns to the first hatchway. An ordinary road-scraper operated by cable is used for the final scraping of the ore to the hatchways. Thus the work goes on with six and sometimes more machines at work in the same vessel. Five vessels may be unloading ore at this harbor at one time. It sometimes happens that five or six additional boats are in the harbor or near its entrance waiting their turn to be unloaded. Lake steamers carry about 30,000,000 tons of ore in a season. One-sixth of this amount is unloaded at Conneaut Harbor.